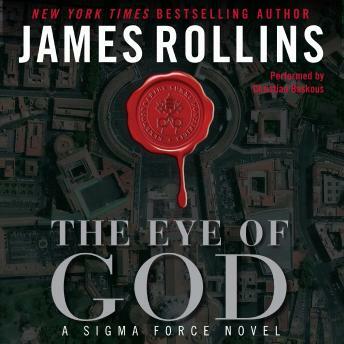 In The Eye of God, a Sigma Force novel, New York Times bestselling author James Rollins delivers an apocalyptic vision of a future predicted by the distant past. In the wilds of Mongolia, a research satellite has crashed, triggering an explosive search for its valuable cargo: a code-black physics project connected to the study of dark energy—and a shocking image of the eastern seaboard of the United States in utter ruin. At the Vatican, a package arrives containing two strange artifacts: a skull scrawled with ancient Aramaic and a tome bound in human skin. DNA evidence reveals that both came from the same body: the long dead Mongol king Genghis Khan. Commander Gray Pierce and Sigma Force set out to discover a truth tied to the fall of the Roman Empire, to a mystery going back to the birth of Christianity, and to a weapon hidden for centuries that holds the fate of humanity. I love the Sigma Force novels however, I was so distracted by this narrator, Christian Baskous, that I found myself bored with the story. I keep remembering the voices of the characters as Peter J. Fernandez portrays them. These characters were all strangers to me. I could not tell who was speaking unless he said the characters name. I do so hope that future novels will be told by Mr. Fernandez!!! The book itself is good, but Peter J Fernandez is the voice of sigma force. I really had a hard time following along with this narrator. Pretty decent story, although it was a bit too much torture at times for me. Awesome as expected from James Rollins. Also Christian Baskous was absolutely amazing in his reading. He reads with such emotion.